Karuna Foundation Nepal won the innovative practice award for Inspire2Care last, as one of the global practices in livelihood for persons with a disability. What does this mean in practice? Imagine you’re Ashley, working as community facilitator for the Inspire2Care programme and you assist people with disabilities and their families. You urge pregnant mothers to go for a health check up, you support integration of people with a disability in the labour market and you support the health committee to raise funds from the government and the community itself. All great stuff but … how does this impact other changes you want to see in how society deals with people with a disability? What is the bigger picture? And what are inter-linkages between these changes? 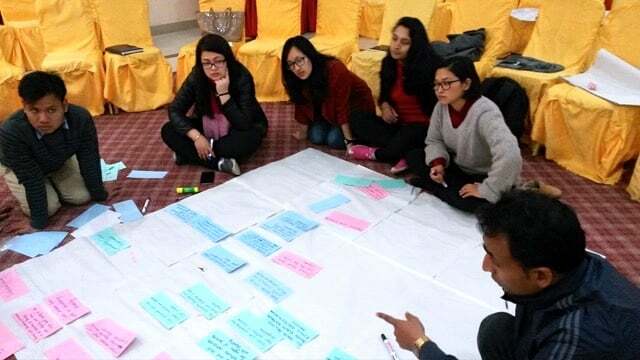 With the Theory of Change facilitated by Hanne Verhoeven, Karuna can demonstrate a clear visualised road map of how the work of Ashley and many other stakeholders have an impact on the life of people with a disability in Nepal. For staff members of Karuna this is both valuable information and very motivational. This is easier than a logframe. We have fewer indicators with more information value. It is more flexible, now the bigger picture is clear from the start! The Theory of Change visualisation will be posted in all offices, so that all facilitators see what they are contributing to. Early 2017 Perspectivity also accompanied several NGO alliances in the Netherlands to develop a Theory of Change related to gender equality.